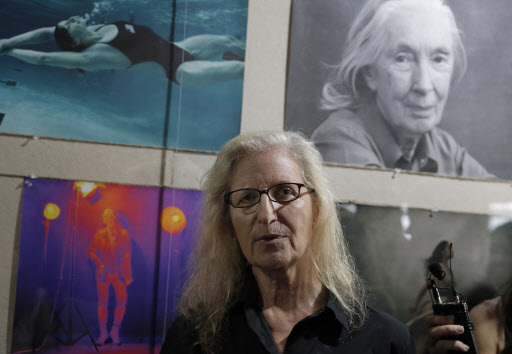 HONG KONG (AFP) -- From dancers to corporate executives and rights campaigners, the latest show by photographer Annie Leibovitz revolves around high-flying women she says are more confident than her previous subjects -- though some still hated having their picture taken. “Women: New Portraits” opened in Hong Kong on Tuesday, the fifth stop on a 10-city tour, displayed in a bare bones setting on a disused floor of an industrial building. The images were produced on an Epson printer in her office, says Leibovitz, who opened the show, and are tacked to the walls with drawing pins. The U.S. artist, renowned for portraits of leading figures from John Lennon to Elizabeth II, calls the collection a work in progress. It is a continuation of a project published in 1999 called “Women,” a collaboration with writer Susan Sontag, with whom she had a relationship. Whereas the original collection incorporated women who were not in the public eye, the new set revolves around those who have made a splash in their chosen field, a decision Leibovitz defends. “I am very aware of women’s issues ... but I have to be careful of how I venture into them,” she told reporters. The new works include portraits of young Pakistani education campaigner Malala Yousafzai, dancer Misty Copeland -- the first African-American woman to become principal dancer at the American Ballet Theatre -- and Facebook executive Sheryl Sandberg. -- not one woman here is more important than any other,” Leibovitz said. Leibovitz says she hopes to work further with Yousafzai and with Myanmar’s veteran activist, now foreign minister, Aung San Suu Kyi, also in the collection. But while her new subjects are all leaders in their field, not all were comfortable in front of the camera. British primatologist Jane Goodall declared that she preferred going to the dentist than having her photo taken, before sticking her tongue out, says Leibovitz. “I got back to my studio and realized ‘oh my goodness’ it’s like I’m a primate -- she's communicating with me with her face and her eyes and sticking out her tongue. “If I was an orangutan I’d be madly in love with her,” she laughs. Still, the shoot produced a soft close-up portrait of Goodall, tongue in. Leibovitz says she sympathizes with hesitant subjects. “Who wants to have their photo taken?” she asks.